We had several of our own members taking part in the Dengie Second round qualifier, which was great as we were organising the show! Well don e to Lily and Jazz who came 3rd and Jodi with Sparky who were placed in 5th! Congratulations to Ciara and Louie who had a wonderful double clear to take 2nd Place and they have qualified for the championships! Great round by Lola, Charlotte and Lily who came 2nd, 5th & 6th respectively! Congratulations to Izzy for her first place on Hollie and to Ele for her 2nd place! This was a busy class and congratulations go to all 3 of our members as they were all place! Sophie in 1st place, Ele in 5th Place and Izzy in 6th place! Congratulations to both Sparkes sisters who qualify for the championships! We would like to say a huge thank you to all our members who volunteered to help us deliver this area event! We could not do it without you. Thanks also to our committee who went above and beyond and to Niki for her brilliant organisation!! Good Luck to Ciara, Sophie and Ele at the Championships in April!!! 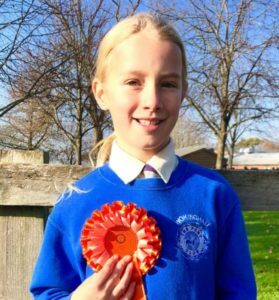 The Dengie second round Dressage qualifier took place at Priory Equestrian and we had two of our members competing. Both combinations did a great job, with Phoebe attaining 4th place and Alice 7th in the Novice, and Alice had a lovely ride in the Intermediate class, coming 5th! Very well done to both of you!!! At the end of a very busy half term our Triathletes were out on this beautiful day, taking part in the South Berks PC run Area 13 Winter Triathlon qualifier! Evie Turner came 4th individually and was part of a tadpole mixed team who came 1st! Emma Donaldson and Olivia Turner were both part of a Mini mixed team, coming 7th. Olivia O’Brien, in her first competition at Junior level, did an amazing job, coming 4th in the competition and part of the winning mixed team. However, as she was the best competitor from Area 13, she qualified and joins Becky Storer (who qualified earlier in the month) at the Winter Tri champs!! Well done girls!! Fantastic result! Great day at the Area Quiz run by HH on 23 Feb!! The quiz was tough and the girls did a great job with Sapphires places in 5th, Sapphires in 4th and the Rubies came 2nd!! They all worked hard, had great fun training for the quiz and had a fabulous camaraderie today!! So proud of you all!!! Lots of our members took part in the GHPC competition at BCA and had a fantastic day!! Our Minis teams were out bright and early for the 50cm Class! 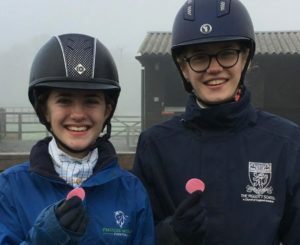 They got off to a great start with the Wokingham Orange Team – Alice A on Breeze, Freddie D on Pete, Emma D on Rodney, and Evie T on Pinkie got Team 3rd! 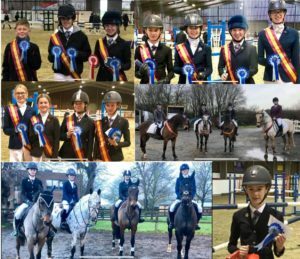 Wokingham Purple Team – Emma Donaldson on Jojo, Seb Naish on Polly, Lola Nessling on Magnet and Olivia Turner on Blackjack WON the class, with individual placings for Lola in 5, Olivia 6th and Emma 7th!! 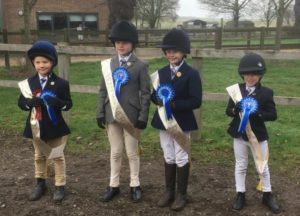 In Class 2, (60-65cm), the Wokingham Yellow Team of Lola Dance on Pip, Dillon Flew on Clint, Daisy Hamble on Honey and Olivia Turner on Blackjack WON the Team competition with Individual placings for Lola in 1st, Daisy 2nd, Dillon 9th and Olivia 10th!! 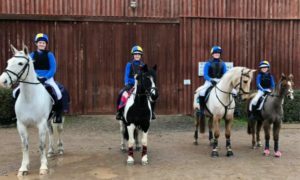 Class 3 was also busy with 2 team – the Wokingham Green team were Jodi Carter on Sparky, Charlotte Kirkham on Danny, Olivia O’Brien on Sam and Holly Woodford on Jupes and the Wokingham Black team were Jodi Carter on Caspian, Lola Dance on Pip, Lily Hamble on Jazz and Phoebe Murray on Mabel. The Black team did really well coming 2nd and individual placings for Lola in 2nd, Phoebe 3rd and Jodi (sparky) 4th!! 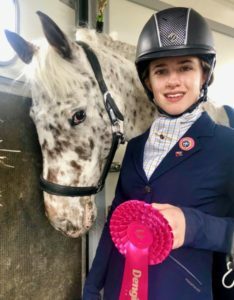 And last but by no means least, congratulations to Holly Woodford and her lovely horse Tina who won Class 6 (1.05m) with a splendid super fast clear round!! The team spirit was fantastic to hear about and so lovely to hear you were all supporting each other so well!! Thanks also to the lovely Niki Robins for all her help and support too!! Fabulous results!!! Very Well Done!! 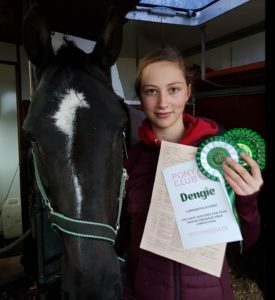 Very well done to Alice Lamburn and her lovely Leona, who came 4th to qualify for the Dengie Winter League Intermediate Area Dressage Finals in March. This adds to Alice’s qualified status for the Dengie Novice Class too! 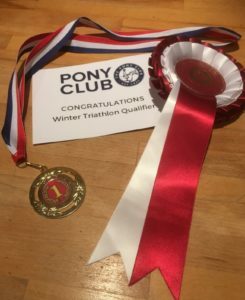 Congratulations to Becky Storer who qualified for the Pony Club Winter Championship, Milton Keynes, to be held in March having won the Open Girls Area 11 Winter Triathlon today for Wokingham. Today saw our members taking part in the SC&SH Eventers Challenge at Merrist Wood! This competition is a tough one with challenges at every turn! 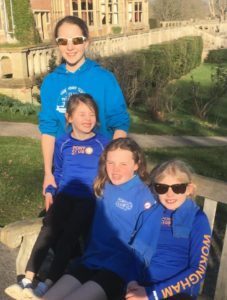 In the 60-65cm the Wokingham Blue team of Lola Dance on Joey, Nancy Gittus on Chyna, and Jess Ingham on Jay came team 4th with Jess placed 7th individually and 4th in the style section and Lola placed 3rd, with a 5th in the style section! Great support from Emma D for the team! 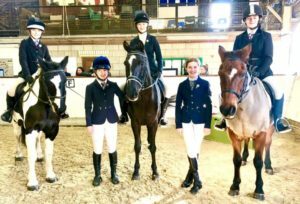 Class 2 – 70-75cm – also went well with Wokingham Yellow team of Lola Dance on Pip, Emma Kavanagh-Gibbs on Daisy, Charlotte Kirkham on Danny and Olivia O’Brien on Sam who finished on zero to get Team 1st!!! Olivia also got 6th place and Charlotte 10th place individually. 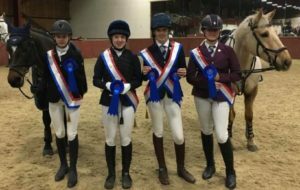 Class 3 – 80-85cm – saw the Wokingham Green Team of Lola Dance on Pip, Charlotte Kirkham on Danny, Ciara O’Brien on Louie & Catherine Voss on Jupiter finishing on zero for 2nd place! Ciara came 2nd with a super fast round and Lola was 6th and won the style section! Congratulations also to Emma Sparks on Finn for her lovely double clear which gained her 4th place in the style section! It was fabulous to see all the support for each other and well done to all who took part! 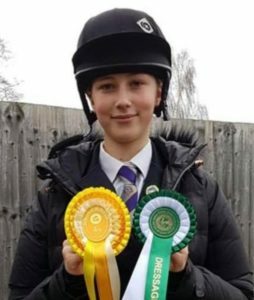 Well done to Alice Lamburn and Leona, who qualified for the Novice Dengie Dressage Qualifier today at the HHPC Dressage Competition at Priory Equestrian in Frensham today. A good ride in the PC Novice Test for just shy of 71% gave them 4th place and a qualification for the Dengie Area Second Round. She came 8th in the PC Intermediate Test! Congratulations Alice! 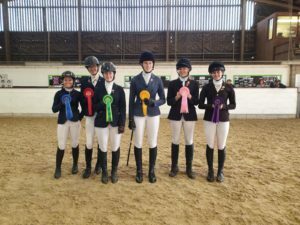 Well done to all our members who competed at the B&SC Pony Club show jumping competition yesterday! 50cm – Olivia Turner & Blackjack placed 1st and Sam Ingham & Mouse were 7th! 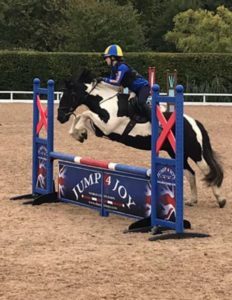 60cm – Wokingham Yellow Team of Lucia Bartle-Jones & Milton, Daisy Hamble on Honey, Jess Ingham on Jay and Olivia Turner on Blackjack were placed 2nd with Daisy placed individually 1st in the class! 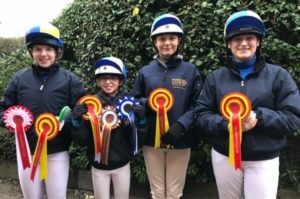 70cm – Wokingham Green team of Lola Dance on Pip, Cruz Furnell-Brennan on Bobby, Daisy Hamble on Honey and Olivia O’Brien on Sam were placed 1st. There were individual placings of 2nd for Lola on Joey and 4th place for Lola and Pip, and a 7th place for Olivia. 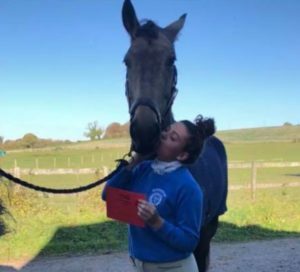 90cm – final placing of the day went to Ciara O, who was placed 2nd in a very tough class and came, qualifying for the Dengie Winter League 2nd Round! Congratulations and well done to you all!!! Congratulations to Phoebe Murray and Ele Sparkes who both passed their C+ Test on 27 December! What a wonderful night!! It was amazing to see nearly the whole branch there enjoying the evening!! Thank you to all the committee who helped to make the night so special, to Joanna Ruddock for the fabulous Camp video and to Debbie Storer and all those who contributed prizes to the raffle and silent auction – we raised an amazing sum for the branch and will be sharing some of this good fortune with the Thames Air Ambulance! Please see below the list of winners and the photos are all up on our Facebook Page!!! Despite the weather and closed roads, the Wokingham shoe Jumpers made it to the GH team show jumping at BCA. 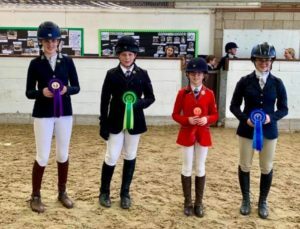 The days started well with the Wokingham team of Jodi C, Cruz F-B, Lily H and Charlotte K who won the team competition in class 2 (80cm) with Lily individual 7th! Well done also to Jemima S-R for her clear in this class too!! 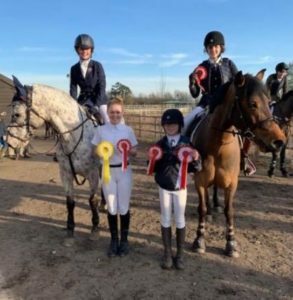 Class 3 (85cm) went well too, with Jodi C, Cruz F-B, Lily H and Ciara O, who also won the team competition with Lily winning the class, closely followed by Ciara in 2nd place! Class 4 (90cm) continued the theme!! With Phoebe M, Ciara O, Ele S and Sophie S winning the team competition and Sophie individual 2nd! 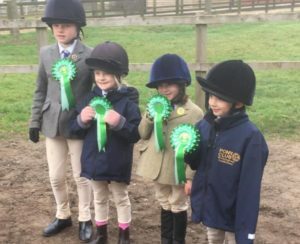 So for the Class 5 (1m) team of Phoebe M, Ele S, Sophie S and Holly W, the pressure was on – well, they rose to the challenge and also won the 1m class and Sophie was individually 1st!! Very well done! So pleased for you all!! 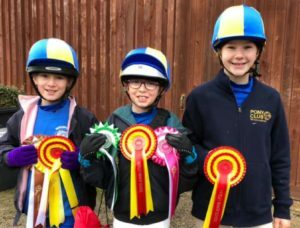 Winter season is upon us and the Pony Club & Dengie Winter League Show Jumping (95cm) and Dengie Debut Show Jumping (85cm) qualifers taking place throughout the winter, culminating in the Area Dengie Second Round Qualifer, that Wokingham are running on 24 March next year!! 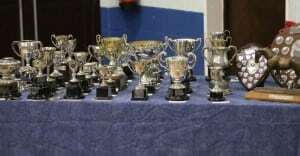 Additionally, we have the Dengie Winter League Dressage qualifers also taking place with the Area second round taking place at Priory Farm in Frensham on 17 March. 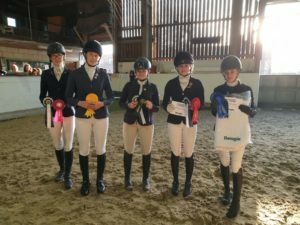 We had a great turn out from Wokingham PC members across the classes on Saturday 17 November at the Garth Hunt Dressage competition at BCA with many successes! Jess Ingham riding Jay came 5th in the BD Intro A Test. Holly Woodford and Priory Juniper came 4th in the PC Prelim 18. 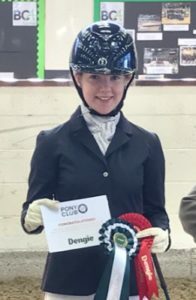 In the PC Novice 2018 Test, we had Phoebe Murray riding Sligo Dot Com who achieved 3rd place, which qualified her for the Dengie Novice Dressage Winter League second round competition in the new year! Very well done!! Also competing in this class were Holly Woodford and Jupiter in 9th place, Alice Lamburn and Leona in 10th place. 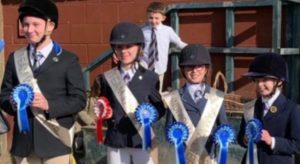 Also taking part were Ciara O’Brien with Culmore Berti, followed by sister Olivia with Sam I Am, who was taking part in their first ever PC Novice Test! Congratulations and well done to you all!! Our member, Becky Storer, competed with the Pentathlon GB Team at the Olympic Hopefuls competition in Poland. The disciplines were Fencing, Swimming, Running and Shooting. Becca did an amazing job, starting in 3rd place after the fencing, she attained a personal best in the swimming and after the run and shoot sections, she individually came 9th (highest placed GB competitor!) on the world stage. Team GB overall attained a podium place in the team competition, coming in 3rd place on a world stage event!! This was a most fabulous result and Wokingham Branch are proud of you!! Congratulations to Mollie Moore who has taken her B Test today and passed!! This is a great achievement!! 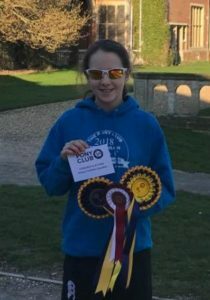 Congratulations to Olivia O’Brien and Sam I Am who won the Mini section of the Chiddingfold PC Tetrathlon this weekend and also won the Area 13 Mini Tet Trophy! She finished first in the shoot and run, second in the swim and clear jumping! What a great achievement!! To add to Libby’s success today at Chiddingfold Triathlon, our Munchkin Team of Jess Ingham, Roxy Giles and Olivia Turner came 2nd with individual placings to Jess 6th and Roxy 8th. 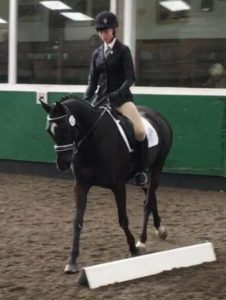 Little Evie Turner was competing as part of a mixed team in the Tadpoles that came 3rd with Evie coming individual 7th. They had a great day despite the rain and were such great team players, supporting each other, which is what Wokingham is all about. 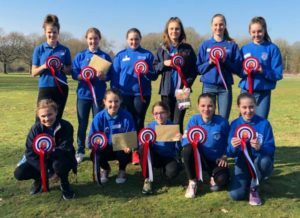 Well done girls – so proud of you all! !